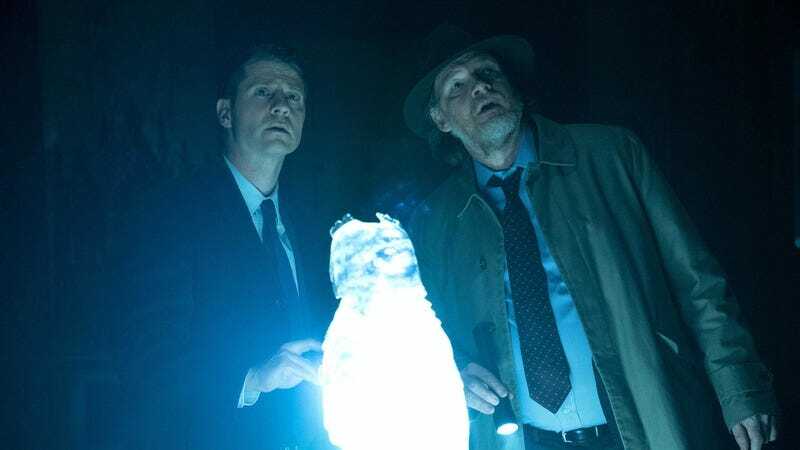 While last week’s episode left Penguin and Riddler—or Cobblepot and Nygma—in a state of tension, they’re quickly back to their old antics this week. It doesn’t mean their buddies, but right at the top of the episode Nygma smacks Penguin in the head to make sure that he’s real. It’s funny and delightful and a perfect character moment, and the first sign that bringing Penguin and Nygma back together, no matter what their dynamic looks like, is a choice that brings a necessary levity to the show. The DoppelBruce is in the wind now, but at least Alfred knows the truth. On top of that he chastises Selina for not being there for Bruce. It’s quite a stirring speech, and filled with little truths, like the fact that despite all of Bruce’s flaws he’s been intensely loyal to Selina since the beginning. Speaking of Bruce, he’s now fully under the influence of The Shaman (Raymond J. Barry). 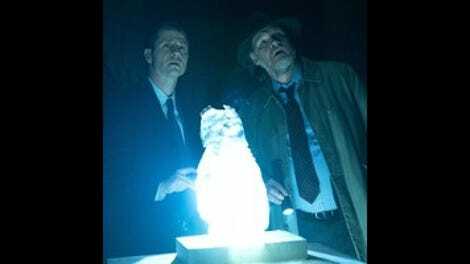 The scenes with the two of them have been a bit of a mess; the kind of vague, listless storytelling that Gotham too often indulges in. At the same time, there’s hope that this training gives Bruce some sort of character depth outside of Wayne Enterprises and his relationship with Selina and Alfred. Is this the last we’ve seen of Barnes? He’s used as Kathryn’s henchmen here, putting Jim Gordon on trial and choosing to execute him via beheading. Of course that doesn’t come to pass, as the GCPD saves the day, and Barnes is eventually taken down by Gordon. Hopefully that means there’s no more terrible lines of dialogue involving “being guilty” and “judging” in the future. With Gordon unable to give her the closure she’s looking for, Lee seeks out Jervis Tetch, hoping to get him to explain why he infected Mario if his goal was to hurt Gordon. His answer is pretty simple: he could tell that Lee still loved Jim, so the easiest way to hurt him was to make sure that he never received that love. So, he infected Mario knowing that Jim would save Lee, and that in turn Lee would end up hating Jim for it. Thus, the one truly responsible for all of this, in Tetch’s mind at least, is Lee. That scene ends up being more important than one might assume, as it leads directly to the episode’s final shot. Lee has seemingly left the GCPD, telling Gordon that she’s the only one willing to atone for what she’s done. So, she steals the sample of the virus from her lab and injects herself at the end of the episode. It’s difficult to be excited about more stories involving the Tetch virus, but at least with Lee there’s some emotional trauma that could be dramatically fruitful, if Gotham is willing to really dig in of course. Where is Barbara?!?! This absence is unacceptable.